My friend Nadia "Toughspirit" Burgess and I will be sharing a table at MoCCA Fest this weekend! Table D153 ... on the FIRST floor this time! Not 4th like last year... the new venue only has 2 floors thank God. It's at "Metropolitan West" 639 West 46th St, right by the Highline and the Intrepid! Only $5 per day to get in! Kids under 12 are free. Saturday April 2 and Sunday April 3 from 11A-6P both days. A major special guest this year is my former cartooning professor, Phoebe Gloeckner!! Her work The Diary of a Teenage Girl, an account of her teen years in prose and pictures, was recently adapted into a critically-acclaimed and award-winning film! The book "received notable recognition as well as controversy for its honest portrayal of teenage sexuality with themes of drug use and childhood traumas.She'll be part of the official programming, going on at Ink48, around the corner from the fest (653 11th Avenue at 48th Street). VERY EXCITING!! This is how I felt after MoCCA Fest, and all conventions for that matter! From my new comic "Apartment Hunt." MoCCA Fest turned out OK, despite being on the 4th floor, I didn't suffer a loss like I feared. But I certainly didn't do as well as in previous years, where all the vendors were on one floor in the Armory. At Center 548, the stairs were really steep, there was only one small elevator, and lots of people didn't even know there was a 4th floor. I think it's best for conventions to keep all the vendors in one floor, and have programming be on another floor if need be. But I sold 16 copies of my new comic "Apartment Hunt!" I ended up swapping lots of crazy apartment hunting stories with people. It's something everyone can relate to in NYC. I did talk to some who got a great deal because they knew a landlord... note to self - befriend some landlords. I wonder how well the comic will sell when I exhibit in other cities. Apartment hunting in general is a pain, but nothing... NOTHING compares to the ridiculousness that is the NYC hunt. Charlie Brown, licking his lips about to feast upon all the MoCCA-festers. Finally am recovering from MoCCA Fest. It was SO GREAT this year! Met some inspiring indie comic creators, reconnected with old friends, sold some of my comics, got some interest in my freelance services. I heard there were over 4,000 attendees on Saturday alone, which was more than both days last year! I felt very honored to be a part of such an amazing festival. Everywhere you looked there was someone's comic/merch/fun stuff they poured their heart into. The Lucky Penny: Unlucky in Love? Ever since the Society of Illustrators took over MoCCA Fest, it's gotten better and better. I think my favorite part this year was such a nice reception with free food and booze for all the creators and volunteers. It was wonderful to be treated to something like that and I got to make friends and network and just talk about comics and animation and all that cool stuff. I wish MoCCA was more than just once a year, because it has an underground, artsy vibe that NYCC or the more "fanboy" shows don't have. I want to get into more indie fests. Didn't get into SPX this year to exhibit, but maybe I'll go just for fun. tags: MoCCA Fest, MoCCA Arts Fest, mindy indy, Nadia Burgess, Charlie Brown, The Daily Misfortune, The Lucky Penny, "Unlucky in Love?" MoCCA Arts Fest TOMORROW! And Sunday! I've been tweaking my new Squarespace site for awhile, but now it has all the necessary info that I'm satisfied with it's state for MoCCA Fest! If you're reading this blog post in an email or from another social media site, check out www.mindyindy.com ! I finally "pointed" the domain name in the right direction. Now it's more of a professional folio site, with the main page being my work and not my blog, as in Wordpress. And I'm not as constrained space-wise to a narrow strip - check out the custom comics section, where you can see the comic pages in their entirety and not chopped up. 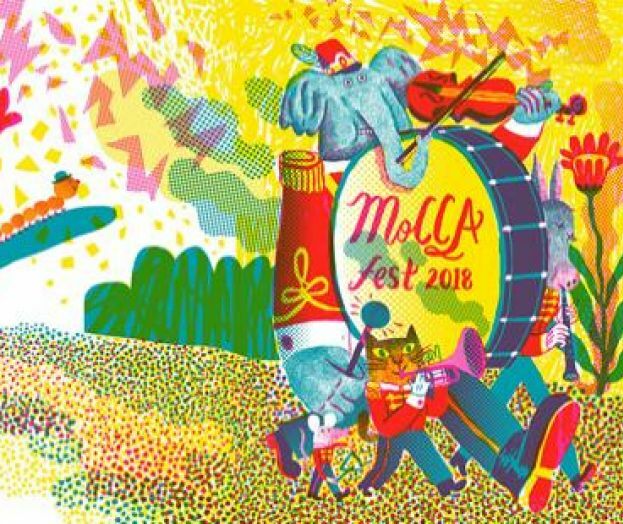 MoCCA Arts Fest THIS WEEKEND! I'm sharing a table with my friend Nadia Burgess at table D9 - right smack dab in the MIDDLE of everything! Being right on the corner of the main aisle is an amazing opportunity for prime exposure. Take the 6 train to 23rd or 28th St. So yesterday I included color in The Daily Misfortune as something different for April Fool's, but I kind of like it. I AM a colorist, after all, and I do have a bit more time recently to play with it. We'll see how long I keep up different crazy colors... In the meantime, gotta prepare stuff for MoCCA Fest this weekend - hope to see you there! Finally starting to recover from the weekend craziness that happened at MoCCA Fest! A very intense weekend - there was a great turnout for both days of the convention. This year it was run by the Society of Illustrators and I saw lots of improvements in compared to previous years: the red curtains not only divided the space nicely but provided some "wall space" for exhibitors to pin artwork to. There were nice banners clearly marking the aisles. There was a super delicious free dinner for exhibitors and volunteers on Saturday (much needed, since everyone was exhausted and starving by the end). They were also very helpful to me when I had a problem (more on that, read on) Basically, the Society of Illustrators rocks! I shared a table at this con, because it was pretty expensive. Had as much space to work with as in NYCC (about 3 feet wide). I learned the hard way that even though you do save money up front in table cost for half a table, you sacrifice visibility and accessibility, which results in not as many sales. It so happened that a group of exhibitors in my area was blocking my table for most of Saturday. Their strategy was to have 3 to 4 people standing in the aisle, getting people's attention and driving traffic to their table. Some of them were right in front of my space and some in the middle of the aisle but I saw people going around them and missing my table. While this strategy worked well for that company, it really hurt my sales (I've done enough cons to know I should've been making more money for a con that size on a Saturday). I kept asking each of them if they could please move, and they did, but the same thing kept happening all day. I know this group didn't intentionally mean any harm to me, and they seemed like nice people, but the fact was they weren't mindful of their neighbors and were hurting my business. At one point I got in the aisle in front of my table and did the same thing - tried handing out free cookies but people didn't want any. I tried holding some mini comics out and had a few people interested, but it was very stressful and I felt like one of those people in Times Square that hassles you to buy something on the street - I didn't like it at all. Most importantly though, why was I paying $200 for half a table when I'm not even at my table?! There were some people just walking around with their comics on a tray and sold stuff that way - all for the price of admission - $15. The next morning (it was a 2 day con) I explained the situation to Anelle Miller, who organized MoCCA Fest and is head of the Society of Illustrators. I love this woman - she was able to track down an empty table and had 2 volunteers help move all my stuff there! I felt like Anelle and others that ran the fest really cared about me and wanted me to have a positive experience. I'm totally thankful to everyone that had a part in helping me out! I learned from that experience that life presents you with all kinds of obstacles and challenges that you have no control over, but you CAN control how you react to them. If you find yourself in a situation like this, don't just sit there and be like "oh well, there's nothing I can do." First talk kindly yet firmly to the person/people interfering with you. If the problem persists, get help from a person running the convention/art show/event and they'll find a better solution. This situation isn't all that uncommon - I had a little bit of it at NYCC too (mostly friends of one exhibitor next to me just hanging around), but not to this extent. I'll add this experience to my lecture "Get Started: Selling Your Comics at Conventions!!!" on Saturday, April 20th, at Super Heroes for Hospice in West Orange NJ. Here are some sketches I did. This guy is writing a story about tiny people. He wanted the artist to draw themselves in the picture as a giant doing something mean to a tiny person (him in the picture). This girl wanted me to draw her driving a monster truck. I love random fun requests like that! Thank you all very much to everyone who stopped by my table! MoCCA Fest was a success thanks to all you peeps :) I had a great time overall and am looking forward to next year's fest! Just take any train that connects to the 6 train and get off at 23rd St. or 28th St, as shown above. My table is F194. When you walk in the entrance, just go to the left-most aisle and walk to the back. I think it's a good spot to be, because I've always walked the perimeter first before going to the middle. Hopefully we'll get lots of traffic. This is a fairly large convention, but nothing as crazy as NYCC so I'm not worried about being in the back. I'll be sharing a table with Ellen Stedfeld and Pronto Comics. Also check out some of the great panels and presentations going on this year! Gonna be super fun and hope to see you this weekend! Oh we all love the holiday specials, but have you seen these gems? And check out all the other great exhibitors that are going to be at MoCCA Fest. It always boggles my mind how many people ask me to watch their computer at a cafe while they go to the bathroom or get another drink. I NEVER trust anyone with my laptop - it's far too precious to me to risk it. I'm at a cafe today working because I felt too cooped up working for hours in my apartment. Did I mention I'm coloring a Power Rangers comic now? It's by Papercutz. It's a lot of work, but a ton of fun! Both Papercutz and I will be at the Kids Comic Con coming up in May. And don't forget to come to MoCCA Fest next week! Have a great weekend and Happy Easter! Today I'm a "Featured Exhibitor" on MoCCA Fest's tumblr. Please come to MoCCA Fest in 2 weeks! It's April 6th and 7th, 11AM to 6PM. It's at the Armory on Lexington Ave. in Manhattan. More details to come, no time to blog much today. But this is very exciting for me because it's the biggest indie comic con in NY!